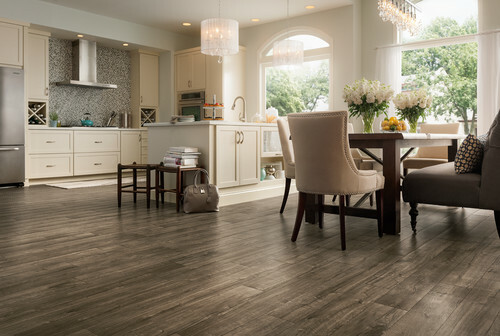 Luxury Vinyl Tile, or LVT as we call it in the industry, is quickly becoming a go-to flooring options for designers and homeowners in Wilmington, NC. We’ve waxed poetic about LVT before — the master imitator, LVT is designed to look and feel like natural wood, stone, or tile, with a lower price tag and increased durability. Considering new flooring for your home? Here are a few reasons to choose Luxury Vinyl Tile. The Look: LVT is available in a number of colors, patterns, and textures from natural marble and stone to bold and contemporary mosaics. You can easily add interest to your floors with LVT’s wide range of options. Like LVT, LVP (luxury vinyl plank flooring) is designed to simulate the experience of real wood flooring underfoot, even when it comes to finishing style. With LVP, you can choose planks with a smooth finish or a hand-scraped, rustic texture. Affordability: LVT flooring is a luxury you can afford. It’s less expensive than its natural contenders — hardwood, ceramic, and stone — yet it looks just like them. 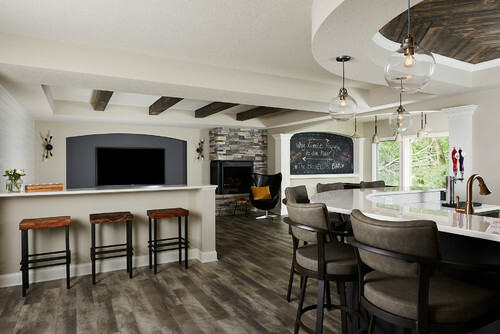 Beyond the price of materials, installation costs are lower as well because LVT doesn’t require the same labor-intensive carpentry that comes with real wood flooring or tricky tile work. Durability: Hardwoods scrape and warp, especially in high-humidity areas like Wilmington, NC. But LVT is built to handle lots of foot traffic, and it’s flame and moisture-resistant — perfect for beach house flooring. If you live in a flood-prone area, this may be the one type of flooring that doesn’t require replacing. Versatility: While some flooring options are confined to certain areas, LVT flooring is a great choice throughout the home. With textured grip and slip-resistance, it’s a safe choice for spill-prone areas like the kitchen or bathroom, while its quality design easily extends into the living room, dining room, bedrooms, and even hallways and stairs. Compatibility and Comfort: Radiant floor heating is becoming increasingly popular for its energy efficiency and warmth. Naturally, heated floors aren’t compatible with wood floors, as warping and damage occurs over time. LVT flooring, on the other hand, is perfectly compatible with heated flooring, and the thickness of the tile provides added cushioning other materials like hard ceramic and stone won’t provide. Easy Maintenance: While LVT comes with the same look and feel as its competitors, it doesn’t need the same level of upkeep. Unlike hardwood flooring, LVT does not require refinishing. And unlike some tiling, LVT needs no resealing. Because LVT has a protective layer, it’s also resistant to scuffs, stains, chips, cracks, and dents. If you’re looking for flooring that provides all of the above for an incomparable price, LVT flooring makes a great choice. To get started on your custom flooring project, give us a call at Crystal Carpet & Flooring Company or come by our showroom to take a look at our latest offerings.